This should be on the bucket list of any serious motorcycle enthusiast. Actually it's known as the Barber Motorsports Park, which includes the Barber Vintage Motorsports Museum, a 2.38-mile race course, the Barber Proving Grounds, off-road riding areas and various campsites and pavillions. The entire park is a veritable art museum featuring modern sculpture, placid bodies of water, bridges and gardens. 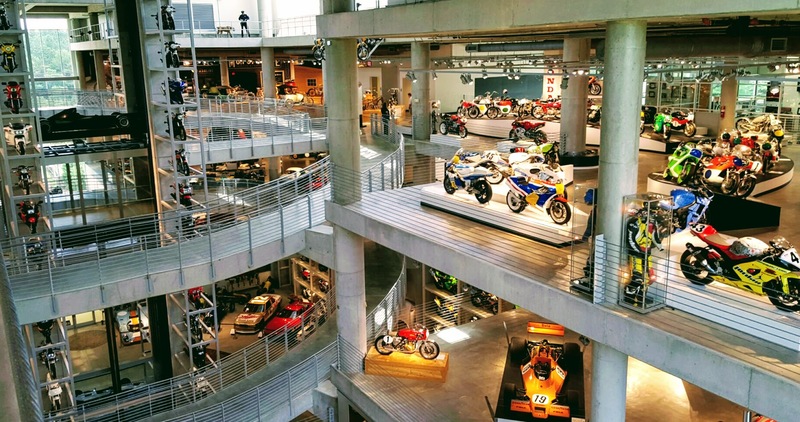 The museum features more than 1600 vintage and historic motorcycles in an architecturally stunning display. All eras are represented- including the earliest wheeled vehicles. To round out the collection historic racing cars are displayed on the lower levels.